SOMEONE KNOWS LANA’S SECRET—AND HE’S DYING TO TELL. LANA GRANGER LIVES A LIFE OF LIES. She has told so many lies about where she comes from and who she is that the truth is like a cloudy nightmare she can’t quite recall. About to graduate from college and with her trust fund almost tapped out, she takes a job babysitting a troubled boy named Luke. Expelled from schools all over the country, the manipulative young Luke is accustomed to control­ling the people in his life. But, in Lana, he may have met his match. Or has Lana met hers? When Lana’s closest friend, Beck, mysteriously disappears, Lana resumes her lying ways—to friends, to the police, to herself. The police have a lot of questions for Lana when the story about her where­abouts the night Beck disappeared doesn’t jibe with eyewitness accounts. Lana will do anything to hide the truth, but it might not be enough to keep her ominous secrets buried: someone else knows about Lana’s lies. And he’s dying to tell. Lisa Unger’s writing has been hailed as “sensa­tional” (Publishers Weekly) and “sophisticated” (New York Daily News), with “gripping narrative and evocative, muscular prose” (Associated Press). Masterfully suspenseful, finely crafted, and written with a no-holds-barred raw power, In the Blood is Unger at her best. "Prepare to be scared. Creepy characters, grippingplot, chilling description — this novel is a perfect weekend read . . . This issimply a great, scary psychological thriller." "[A] gripping novel of psychological suspense. . . [with a] tense, surprise-laden plot." "Nothing is what it seems as Unger pulls off some beautiful surprises in this intriguing thriller. . . . Masterfully told." "A fantastic novel full of suspense and intrigue. Massively recommended." "This fast-moving book is a rollercoaster thrill ride, withholding crucial facts and then pounding you with them as the chapters wind down. It’s a quick, adrenaline-filled read with a slam-bang climax. Unger’s skill with words, combined with a pace that never lets up, is guaranteed to keep the pages turning long past the midnight hour." "Unger's latest offering is full of engaging twists and turns. . . . Skillfully keeps the reader guessing. . . Fans of mystery and psychological suspense. . . will be delighted with this imaginative story." "Reading In the Blood is like grabbing a live wire. . . . A shocking, unputdownable thriller." 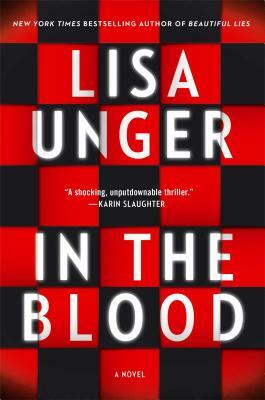 "In the Blood is a riveting new thriller from Lisa Unger. Dark and haunting, with a deadly twist that you won't see coming 'til you're hit between the eyes, this book is a winner." "In the Blood is a psychological thriller that played me--in the best sense--from beginning to surprising end. I guarantee Lisa Unger will pull the rug out from under you more than once, so hold tight."